Last week I promised a post somewhat related to Martin Luther King jr. and the Civil Rights Movement. There is so much information available on the topic I had in mind that it's been hard to provide a concise and insightful post on it. I suppose that's a great argument for why you should be a member of the library -- then you could borrow all of our resources and become an expert on the subject yourself! 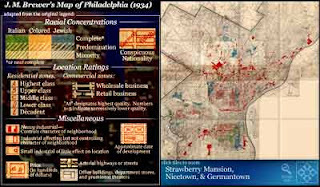 If you click on the map, you will be transferred to the UPenn website on redlining where you can click on different locations on the map and zoom in to see what it says (this is all courtesy of the Free Library of Philadelphia Map Collection). The insurance industry adopted a similar stance to that of banks and as a result it was difficult to get insurance in certain urban areas. In 1968 the President's National Advisory Panel on Insurance in Riot Affected Areas examined the ill effect that not providing affordable insurance just based on locality was having on communities. A 1979 publication entitled Insurance Redlining: Fact Not Fiction, describes the issue by saying:"The problem of insurance unavailability is not one that randomly affects isolated individuals but rather strikes at residents of older urban communities. Insurance unavailability threatens the viability of entire communities." The result of the 1968 examination was the establishment of Fair Access to Insurance Requirements or FAIR plans. As Gregory D. Squires says in Insurance Redlining: Disinvestment, Reinvestment, and the Evolving Role of Financial Institutions, "I have often referred to the issue of insurance redlining as the ugly duckling of the fair housing movement." The Fair plans established in the early 70s required inspection of properties to determine their risk level and provided minimal standards of insurance for hard to place risks. applicant was refused coverage by another carrier. While I would like to report that the threat of redlining has been completely eradicated, there have been well publicized cases regarding redlining filed by the NAACP as recently as the 90s. Still, I hope that Martin Luther King would be proud of the progress that has been made. If you'd like more information on the history of redlining, we have the items cited in this post, as well as Regulatory Challenge Business Principles Versus Social Pressures (an analysis of property and casualty insurance regulation) by Conning and Company; Problem of Property Insurance In Urban America, a Hearing Before the Subcommittee on Housing and Urban Affairs; Full Insurance Availability: Department of Housing and Urban Development and Fairness and Balance in Residential Property Insurance: A National Survey of Homeowners Attitudes. We've also got journal articles discussing redlining.